All transactions are safe and secure with a reliable history in online purchasing behind each of our associates. Buy the I'm What Willis Was Talkin' 'bout t-shirt to own Scrubs clothing and merchandise. 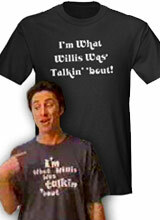 Get your frick on in this NBC Scrubs tee that displays the phrase "I'm what Willis was talkin' 'bout." Wear it as you sing along with the Scrubs theme song sequence that ends with the Scrubs x-ray logo. During Zach Braff's DVD commentary for the episode "My Last Chance," the actor reveals that the x-ray was unintentionally hung backwards. The TV shows creators tried to fix their mistake in Scrubs season 2, but fans and NBC execs liked the backwards x-ray. They convinced the creators to allow the error. Buy it with an NBC Scrubs hat. In addition to the I'm What Willis Was Talkin' 'bout tee above, browse the Scrubs Clothing Gallery for more apparel like men's and women's clothes, kids shirts or hoodies.